Background: Thymidylate synthase (TS) encoded by the TYMS gene is a target for cancer chemotherapeutic drugs such as 5-fluorouracil (5-FU). The overexpression of TS in several types of cancer confers poor response to 5-FU. The interpatient variation in TS levels can be due in part to functional genetic polymorphisms in TYMS gene: one of them is a variable number of 28-bp tandem repeats in its 5'-untranslated region (5'UTR), and the most common alleles are the double repeat (TSER*2) and triple repeat (TSER*3), in the second repeat of the 3R allele there is G>C SNP. In its 3' unstranslated region (3'UTR), there is a 6 bp insertion (+6bp) and deletion (-6bp) (1494del6). Several studies have identified that homozygous TSER*3R shows increased TYMS expression. 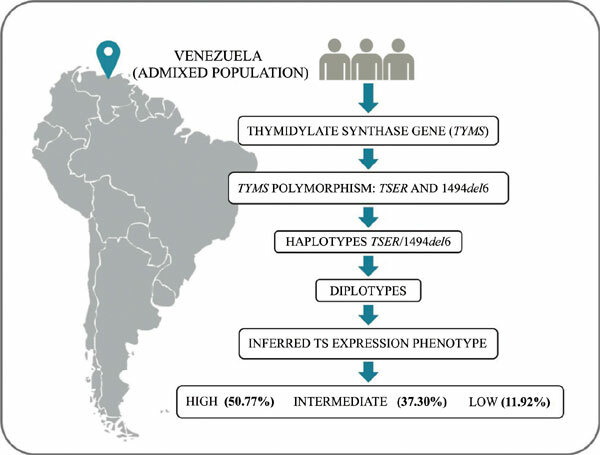 Objective: The aim of this work was to predict TS expression phenotypes based on 5'UTR/3'UTR haplotypes in a population of the Central Region of Venezuela. Methods: The TSER polymorphism was analyzed by Polymerase Chain Reaction, the haplotypes inference was carried out using the PHASE 2.1 program. Based on the diplotypes analysis, the TS expression phenotypes were classified as: high, intermediate or low expression. Results: Six haplotypes were identified whose frequencies were: 2R/-6bp (5.96%), 2R/+6bp (31.70%), 3R/-6bp (31.30%), 3R/+6bp (30.0%) 4R/-6bp (0.38%), 4R/+6bp (0.57%). The frequencies of TS predicted expression phenotypes were: low (11.92%), intermediate (37.30%) and high (50.77%) the latter is associated with poor response to treatment with 5-FU. Conclusion: These results are important for pharmacogenetics, because TYMS polymorphisms are potential predictors of 5-FU therapeutic efficacy and toxicity in some cancer treatments. Thymidylate synthase, TYMS, TS expression phenotypes, haplotypes 5'UTR/3'UTR, pharmacogenetics, Venezuela.